As Bullhorn’s SVP of Workforce & Revenue Cloud, Ed drives the company’s middle office strategy and overall product offering. Ed joined Bullhorn as part of the Peoplenet acquisition where he spent 7 years as the President/CEO leading up to the acquisition in late 2017. Prior to joining the Bullhorn family, Ed has spent his career designing, building and managing technology solutions for numerous Fortune 500 companies. 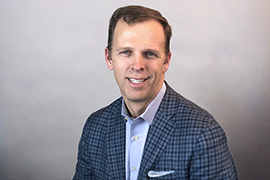 He has been a Partner in an ERP-focused consulting firm, a CIO for a global pharmaceutical company, a supply-chain leader for a retail company and the leader of a services company from its inception to $50MM in revenue. Ed was born in Florida but has spent the last 20+ years in Atlanta, GA. Ed loves to play golf, tennis, and basketball and occasionally gets out kiteboarding when the wind is just right.